Hey all its been a while since i had a chance to do some pixel art. Finally had some downtime and was able to continue with a pixel art course i picked up on udemy. On of the challenges was a background piece. Wanted to know what you guys thought. I like the overall mood of the piece, you're onto something good, but some of the fundamentals like perspective and shading are not correct enough. 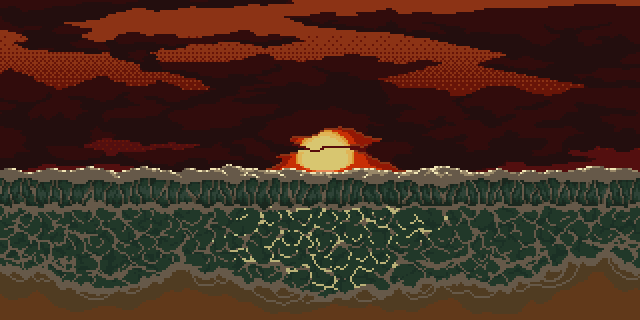 The top half of the image looks like a classical view of a sunset, but the way you have the water foam patterns at the same scale across the whole bottom half, it makes that part look like it's in orthographic view (like a top-down RPG). If it's a flat surface as a beach is expected to be and the whole image is in perspective, the patterns need to become smaller and smaller as they go into the distance. As for lighting, there's no difference between the face of the wave (which should be in shadow, as it's shown) and the part breaking on the beach (which should be lit by the sun). Right now they're both the same shade. One minor stylistic (and more subjective) thing that bothers me is that the only thing dithered is the sky, while in reality that's the only thing with a smooth gradient and other things (sand, clouds) would be the ones with more texture. It's not wrong, and I'm not saying you can only have dither everywhere or nowhere, it's just the least logical choice of what to dither and what not to in my eyes. When I look at the top quarter of the picture at a glance, it makes the bright orange appear as light clouds over dark red background, which is exactly the opposite of the actual scene. The patterns and colors are overall very pleasant and well executed, just needs that correct foundation so that the rest can really shine. Thanks for the critique! I have actually done very little dithering and am still learning the correct placements for it. I will work on lighting of the foam and the placement for the water highlights. I am more used to working in a RPG perspective when it come to water and have a hard time switching it up. I will post the revamped version once I have attempted to make these changes.